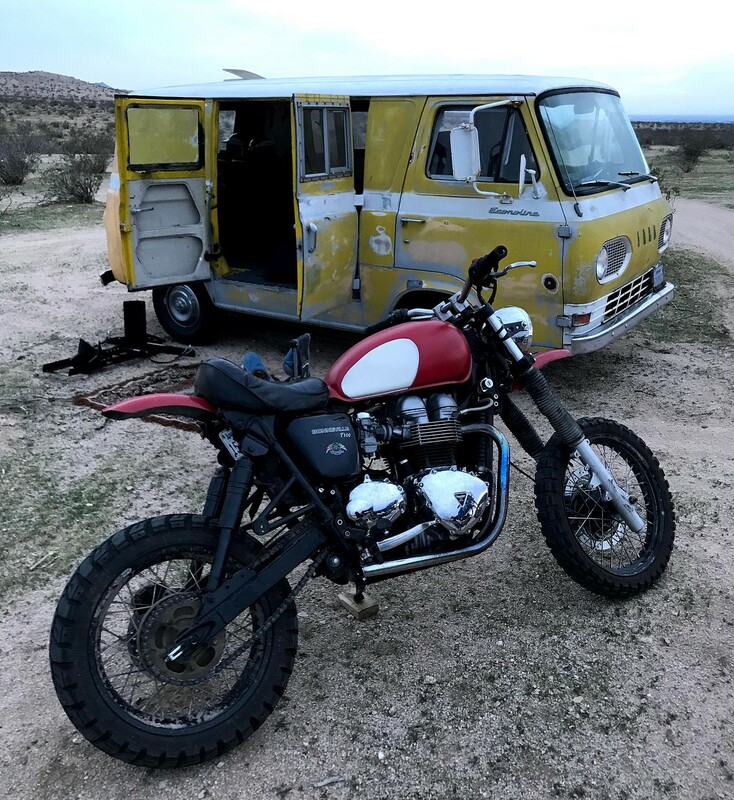 Adventure is the key ingredient for Dave, whose Frankenstein’d desert sled we featured back in 2016. 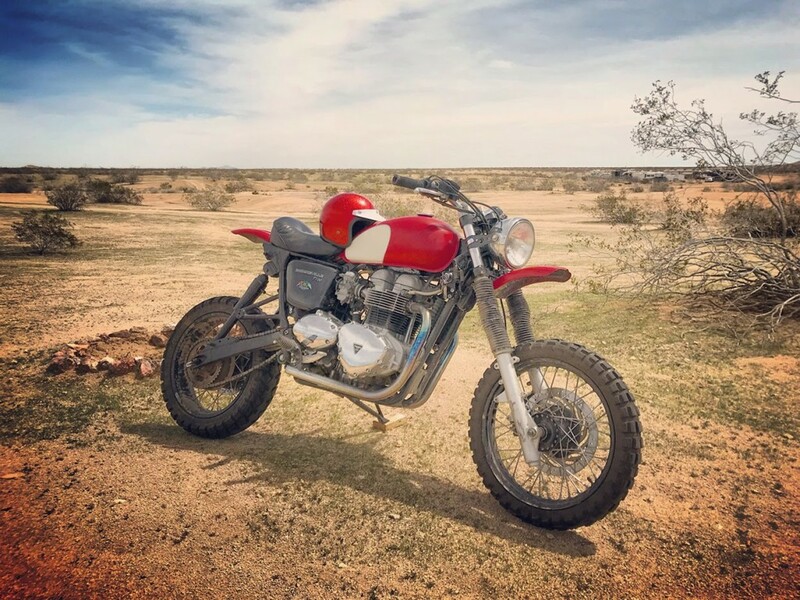 While that mutant sled receives some adamantium (titanium, actually) bone grafts, Dave needed a bike to ride around his favorite deserted moonscape, California City — a massive testing ground for desert race teams. 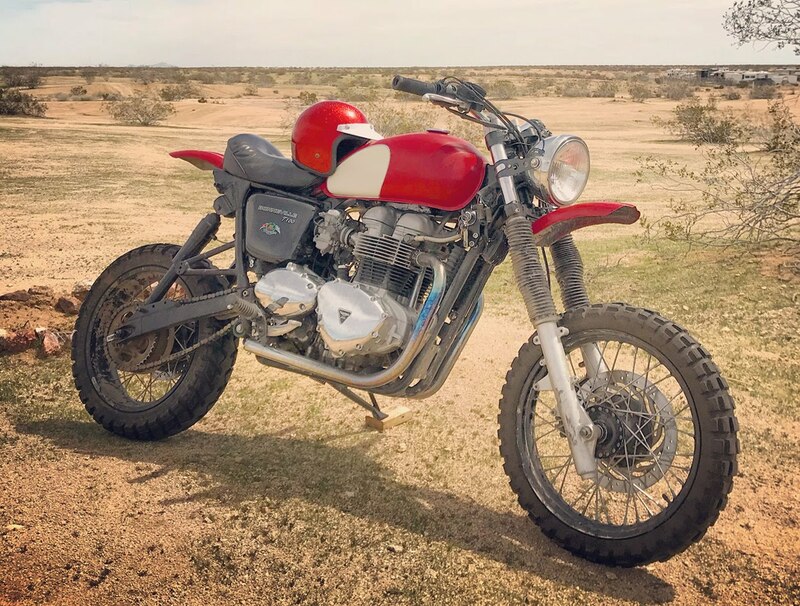 Enter “Vermilion,” this 2002 Triumph T100 Scrambler with 9 inches of suspension travel, truck bed air shocks (for now), and a penchant for blasting down trophy truck chicanes in the vast desert playground of California City. 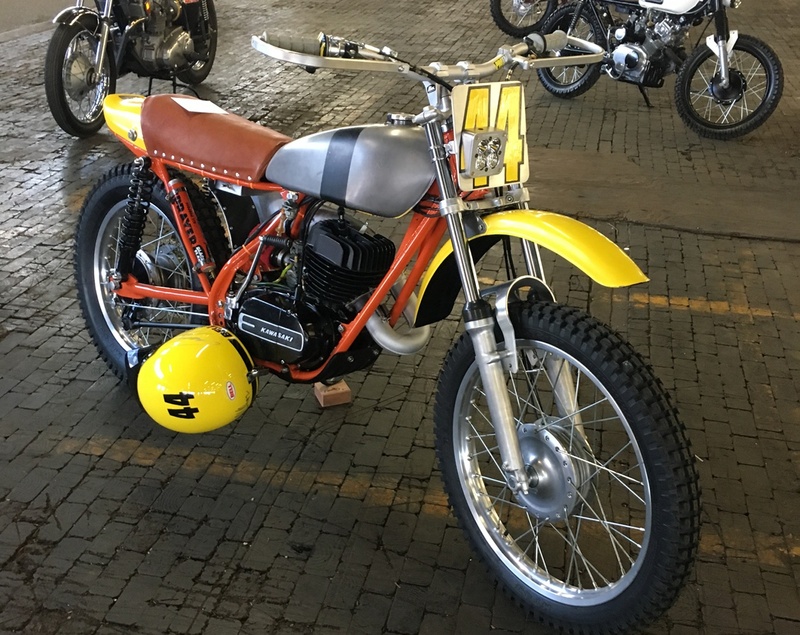 But this bike is not just a pure off-roader — Dave commutes around 100 miles on the bike 2-3 times per week! Below, we get the full story on this badass sled. Back with something a little less NC-17 than the previous desert sled. Calling this one a #StreetSled as it’s ridden to work 2 or 3 days a week for a 85-110 mile commute (no exaggeration Oakland – San Jose – San Francisco all in one day). Rides great, truly a car replacement if you want it to be. 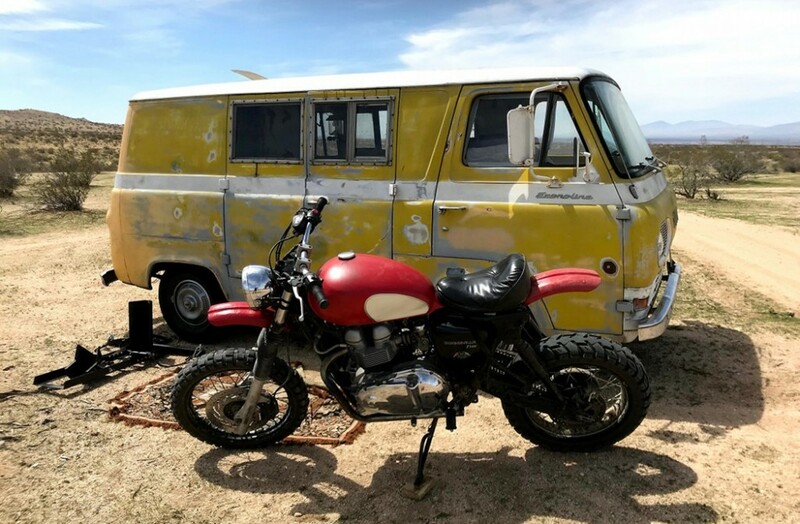 Triumphs are awesome in that way. 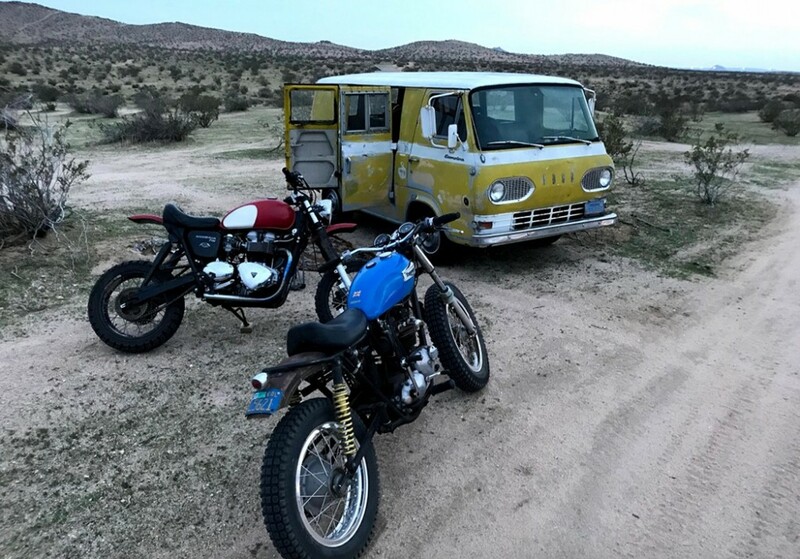 Same can’t be said of most dual sports out there. 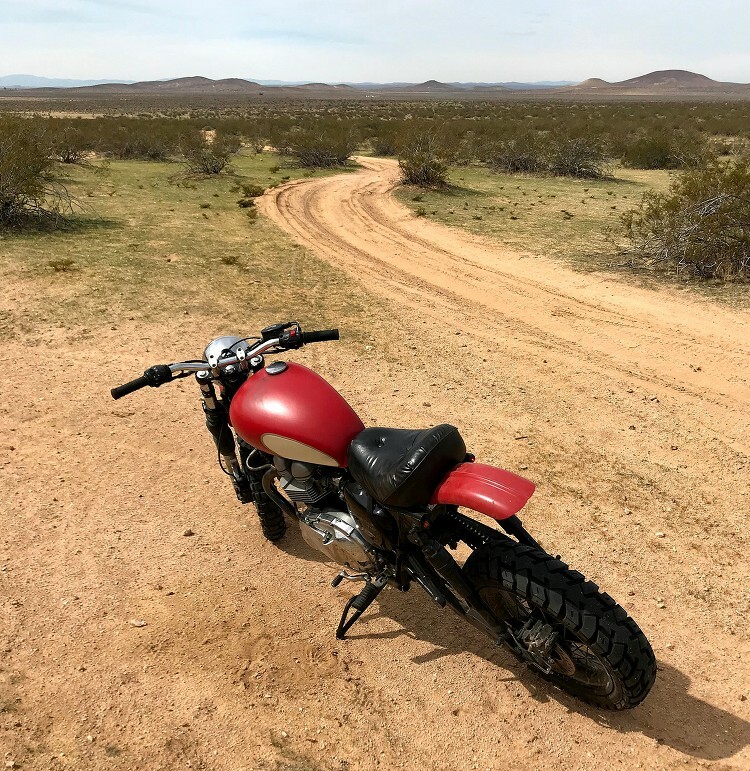 While the original #DesertSled that I Frankenstein’d together is still getting more adamantium bone grafts (titanium actually), I just really, really NEEDED TO RIDE. Not commute, ride. It was pretty bad. I just wanted to grab the tool roll, the bed roll, and head for hills right from work like NOW! Again, out came the angle grinder, but this time only for the seat tubes and swing arm. The frame is stock except for the upper shock mounts that have a new mount welded in. (We’ll see if that stays as is, might evolve a little by fall). There is an idler gear adapted to the swing arm pivot to prevent the chain from scraping, but its hidden under the stock sprocket cover. Runs silent and allows 3-4 more inches of rear wheel travel. Exhaust has insert baffles, but is meant to look chopped. Probably going to be tucking them under a burly, authentic sled type basher for the undercarriage soon. Look for CNC aluminum in forthcoming posts. There’s lots of room to improve the suspension still. Nine inches of front and rear wheel travel is good for open desert trails. The rear shocks are just place holders for the time being. Running truck bed air shocks (Harley forum trick) till I work out the right rates for this geometry. Race tech internals for the forks work very nicely, but the spring is not as progressive as I’d like. Big bikes can really slam down hard on gully crossing or other square edged features. Going to be adding my own air assist in one form or another this spring. 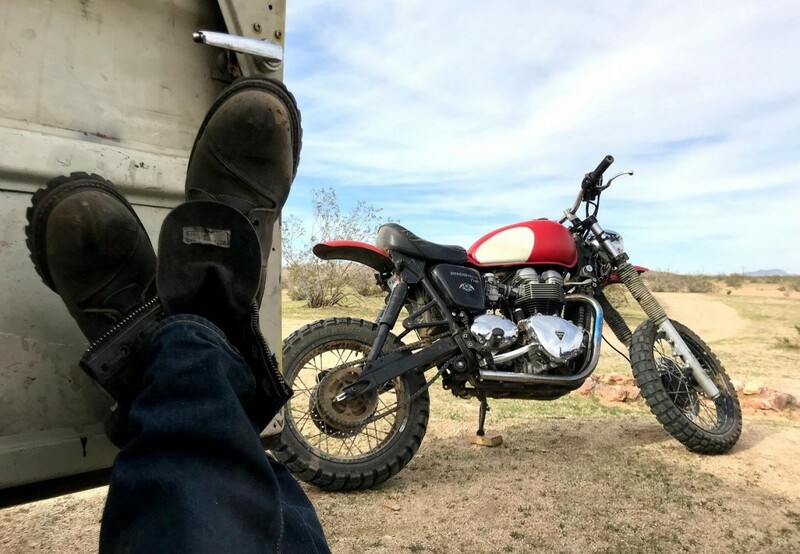 There’s just something soooooo satisfying about rolling into town for a beer and burger when the noon sun gets hot, and then blasting down trophy truck chicanes in the afternoon. 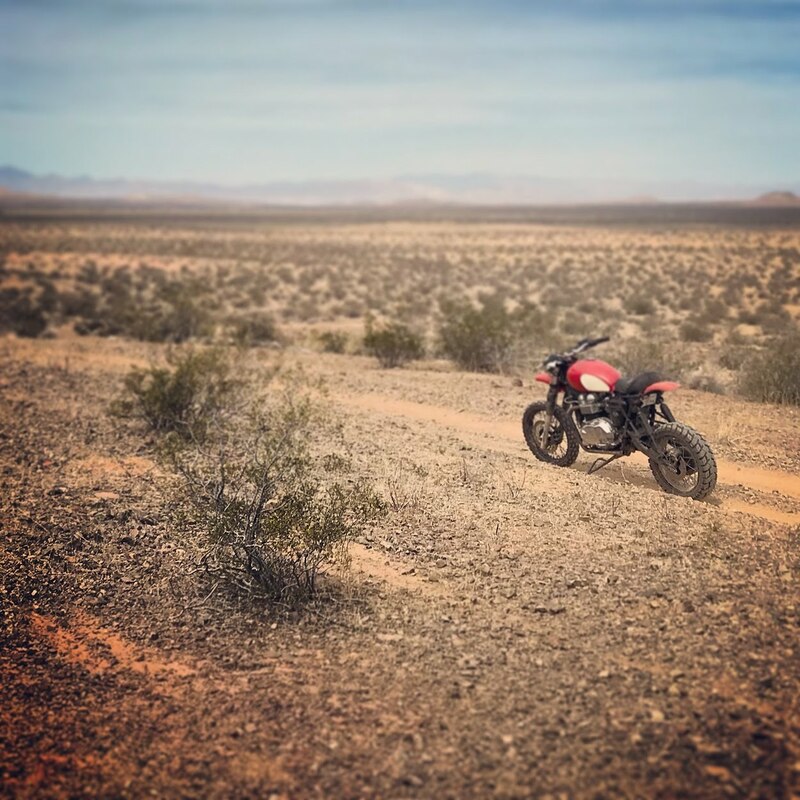 California City is a massive testing ground for desert race teams. If you see a ribbon or caution tape tied to the bushes on the trail, good chance this an actual course from a prior weekend. You’ll be rewarded with just enough berm to hold a higher gear, relatively leveled rocks and nasty bits, a tad more sand, but you won’t be lost for too long — they form loops. The missus appreciates that. California City is a pretty unique place, in that its kind of like a town that time forgot. If you squint, and there are no cars in view, it must have been the same moonscape when D37 racers were ripping from Mojave to El Mirage and back. Basically, unchanged out there. Magic really. 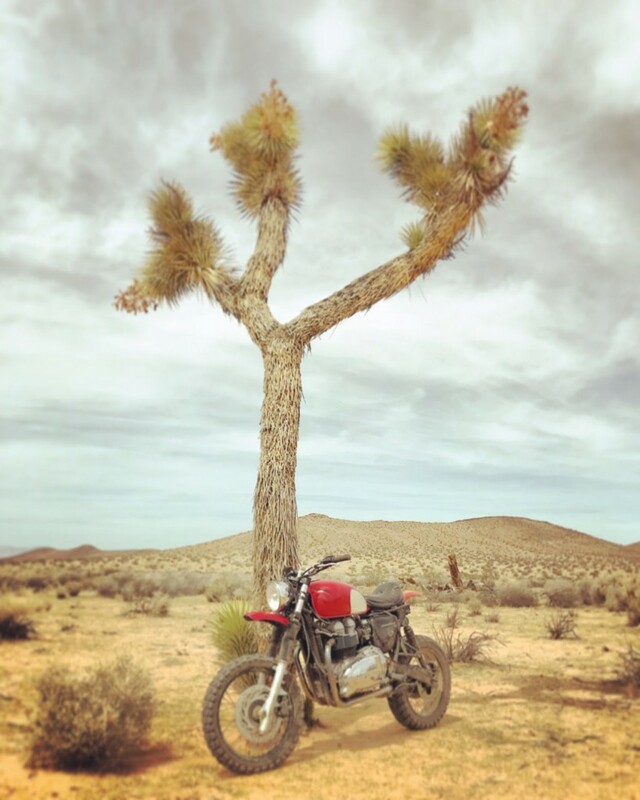 Can’t find Baja-type freedom hardly anywhere in California anymore. Nice bike. 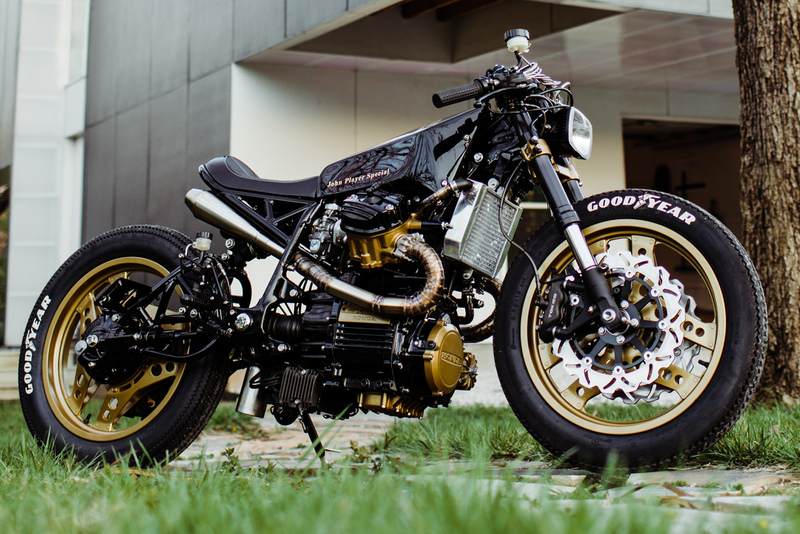 I’m building something similar out of Yamaha XS 650, I won’t have 9 inches of travel, my legs are too short. The type of riding you described is exactly the kind of riding I want to do. The kind that was done before the specialization set in. If you are going to start a club or movement of some kind I’m in. Would love to see it ,as you build it .